Urea fertilization is known to be susceptible to nitrogen losses by ammonia volatilization and depending on fertilizer practices, soil type and environmental conditions this loss can reach 50% of the total nitrogen applied (Harisson and Webb, 2001; Cai et al., 2002). One approach for reducing potential losses of nitrogen in urea fertilization is to reduce urea hydrolyzes by inhibiting urease activity. Urease is an enzyme that catalyzes the hydrolysis of urea into carbon dioxide and ammonia. Inhibiting urease; the urea fertilizer can leach or bind into the soil before hydrolysis to ammonia and captured by the soil colloids thereby reducing losses of gaseous nitrogen. For this reason we use well-known urease inhibitor NBPT [N-(n-butyl) thiophosphoric triamide] inside DASH 46. The main advantage of NBPT is the high efficiency in inhibiting urease at low concentration in a wide variety of soils (Rawluk et al., 2001). 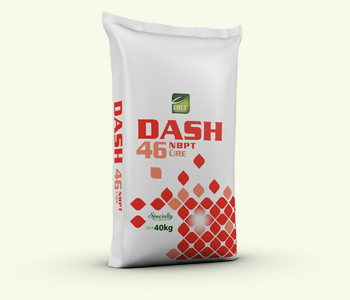 With DASH 46 yield can be increased with the same amount of fertilizer rate. Yield can be maintained with less fertilizer rate. Yield can be increased more than average by increasing fertilizer rate. *compared to traditional urea fertilizers. Urease inhibitors such as Dash46 contain help to hold nitrogen longer in soil, providing more opportunity for plants to uptake. The usage of urease inhibitors can reduce greenhouse gas emissions (e.g., Abbasi and Adams 2000; Di et al. 2007, 2009).